African fashion is renowned for its bright colours and elaborate designs, however little emphasis is placed on the materials used. Kente cloth is probably one of the most recognised African materials, often used as a sign of Pan-Africanism, but little emphasis is placed on the real significance of the material. 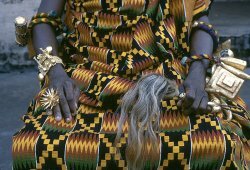 Native to the Akan people in Ghana the material created from woven silk was previously reserved for the King or important chiefs, earning it the title “The cloth of Kings”. 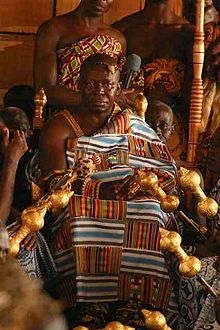 Although Kente is now more accessible, it is still reserved for special occasions, and is presented in some ceremonies in the form of a gift, Kente is still considered to be a material of high esteem, and is often seen on dignitaries such as the Asantehene, Otumfuo Nana Osei Tutu II, absolute monarchy of Ashanti. What makes the material so unique is the fact that authentic Kente is hand-woven using a loom, the cloth is made by weaving individual strips, which are on average 4 inches wide and individually sewn together. Kente has been created in the Ashanti village of Bonwire for several hundred years, the vibrant colours, intricacy of the design and weight of the cloth are all part of what makes Kente a luxurious material. It’s a material you are less likely to find it used it used in contemporary fashion design due to its expense, on average the cloth retails at $400, before an outfit is made by a tailor or seamstress. White—Purification, sanctification rites and festive occasions. What is interesting is the way Kente has been preserved as a heritage material, many young Ghanaian’s and African’s in the diaspora still have an appreciation of its visual, historical and ethical representation, and have integrated this into their contemporary style, examples of this can be seen from A Sauvage’s classic Kente tuxedo jacket, which is a brilliant fusion of African tradition and sartorial style.